Center Latches are accessible from either side of the 22M Shaped Table. Saves time – less walking around tables. Two-stage latches have safety stop and in-use positions. Safer table operation. Door Clearance is not a problem; our folded shaped cafeteria tables easily clear a standard 7’ door frame. The 22M Shaped Table can be easily moved throughout your building. End Leg Assemblies are equipped with ball bearing Poly II swivel casters that automatically contact the floor when table is folded for storage. 22M mobile tables move easily, yet stay in place when open. Height-adjustable models have adjustable legs in 1” increments from 24” to 32” high. Adjusts from early childhood to wheelchair-accessible heights. Unitized Frame offers a longer lasting cafeteria table that doesn’t rely on the top for its strength. Holds up to the rigors of today’s school environment. Poly II Caster Wheels provide excellent floor protection, abrasion resistance, high impact strength, and easy, quiet operation. They are non-marking and resistant to water, oil and most chemicals. 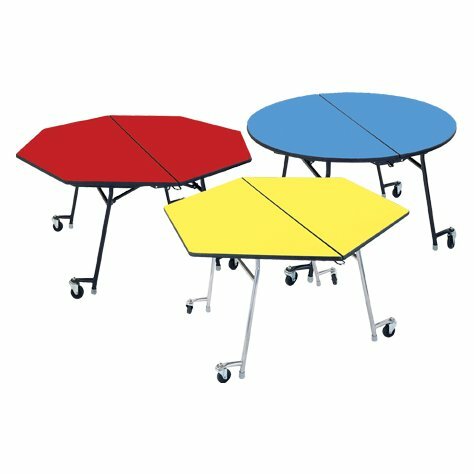 22M school tables move with little effort on these long-lasting wheels.